I just finished reading Roadmap to Revenue: How To Sell The Way Your Customers Want To Buy (Amazon.com link). 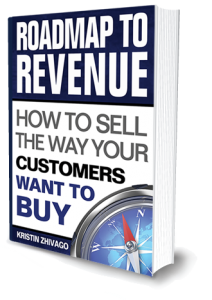 The book was written by Kristin Zhivago, a Revenue Coach and worldwide speaker who helps CEOs and entrepreneurs understand what customers really want and how they want to buy. The book creates an interesting customer experience strategy and follows a logical sequence of explanations and examples to help the reader understand the behavior of customers and what they want. In the very beginning of the book we find out there is no “silver bullet” solution to make customers come to you. In fact many businesses sabotage and impede their own efforts. Fortunately the solutions to success don’t require major restructuring, but knowing how and when to appeal to customers to set you apart from your competition. Buyers don’t always know what they want even though they may approach a particular product or service with interest, but if the buyer doesn’t follow through to the purchase, there arises the question of what happened and what did not occur that interfered with the sale. From Chapters 2 to Chapter 5, the reader discovers the mindset of the purchaser and what to do. In the technological age where any purchaser can Google 80 percent of their questions prior to purchasing a product or service, the onus to answer the specific 20 percent of questions remaining in their minds can lead to disappointment on the part of the customer if the agent for an organization doesn’t have specific answers. Sales personnel and customer service personnel need to be documenting customer questions and making all data available to everyone in the company as well as on websites. The more specific the information pertaining to what a buyer wants, the more a buyer will be attracted to what you have to sell. As you continue to learn what your customers are thinking, you will be able to meet their needs, even as the market changes. Sometimes you just need to make changes to a product -most times by learning through extensive interviews and reports. From Chapters 6 through 12, the reader finds out how to understand the customer. Of four levels of buyer scrutiny, we discover how customers want to buy from us and how to avoid making expensive mistakes. The Scrutiny chapters address each level; Light, Medium, Heavy, and Intense which depends upon particular products or services. The book uses real examples about marketing and selling channels in order to reach customers and answer questions. As social media hype continues to increase, businesses still need to be guided by the vital information from their customers and knowing what is important to them and what specifically appeals to them. For instance, how you handle a buyer who has just researched a product and landed on your website is paramount. The potential buyer is theoretically knocking at your door, so be sure your website is chock full of answers, integrity, and efficiency. On-going relationships, repeat business, and endorsements continue to lead organizations along the road to financial rewards and future success. Bottomline: The book is a good read and is aimed towards retail and consumer service providers. As a real estate sales agent I found many of the chapters particularly focused towards creating a customer service culture using data to build a knowledge base of what customers are looking for and how to interview potential customers to encourage them to buy from me and ultimately make a sale. Pros: Well-written and logically planned. The book reminds us to put customers first and how to think like a customer helping us to create that ever important customer experience strategy to set all of us apart from our competition. Interested: Those interested in the book can buy it on Amazon.com. of clever work and reporting! Keep up the fantastic works guys I’ve added you guys to my personal blogroll.